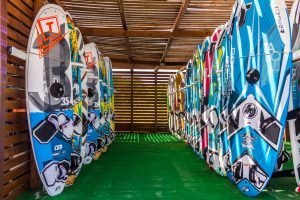 As a windsurf beginner looking for your first spot or lessons, it is hard to really know what you are getting yourself into. It is unarguably a difficult sport that requires dedication if one wants to reach a level of proficiency. However, the emotional pay off, the adrenaline and the sense of accomplishment are just as high. If you have never tried windsurfing, it is best to start the right way – find a school and trust your instructor. Windsurfing is not one of those sports that you can easily teach yourself and looking up the “5 Tips For Beginners” in google won’t magically transform you into a windsurf professional. Instead you might end up spending money on the wrong equipment and getting bored or frustrated by the lack of progress. 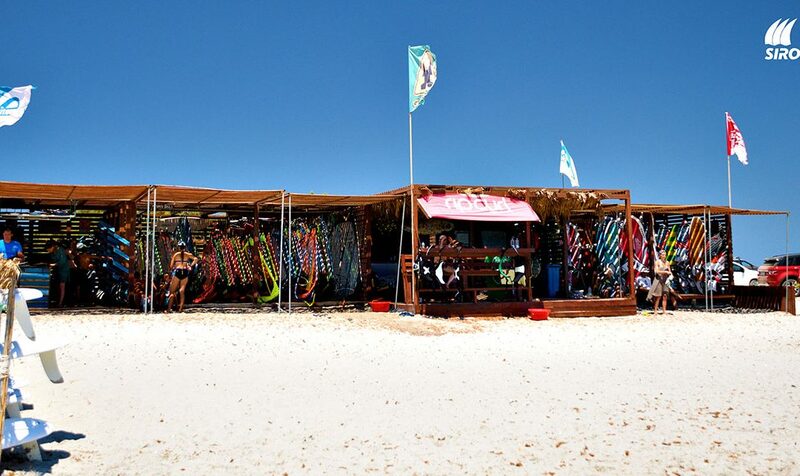 So, to start off on the right foot, try to find a windsurf centre with good conditions and qualified instructors. Yes, it costs money, but this is the most essential component in your approach to this sport. Windsurfing centres are most likely to be located on a spot most suitable for windsurf beginners. 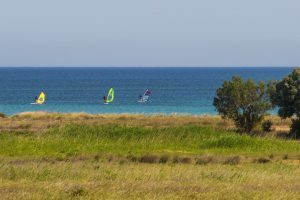 These are normally places with light to moderate winds and flat shallow water, but with the potential for periods of stronger winds to allow progression in your windsurfing skills. These conditions provide the best playground for absolute beginners in their first steps. They are easy for students to learn how to stand up on the board and find their balance, get used to the light wind force to begin with, and learn how to fall and climb back on the board again. Siroko Wind Club is located in a spot precisely like that and while it has great conditions for all levels, it promises an ideal beginner environment due to its favourable light winds in the afternoons. 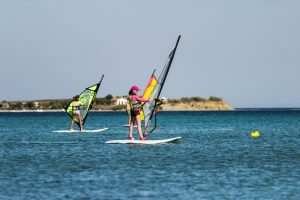 Furthermore, windsurfing is suitable for all ages and Siroko Wind Club has a proven reputation through the years – hundreds of kids and adults have made their first steps in windsurfing and fallen in love with the sport right here on the Siroko Wind Club shores. it can either help you on your journey to a windsurf guru or make it slower and more difficult. At Siroko Wind Club, we have selected equipment especially researched and designed for the relevant level of skills. For beginner lessons we have a variety of suitable windsurf boards. Starting with larger sizes, the students build their confidence and as they progress, the instructor can change the size of the gear to maximise the learning curve. For those who contemplate buying their own equipment, we would advise against it. While owning your board allows you time for practicing, it is likely that, if you are following the instructor’s advice, you will soon “outgrow” your equipment as you progress your skills. For that reason, Siroko Wind Club has prepared package deals for Lessons + Rental, that allow students to practice what they have learned during their time with the instructor. Your first lesson starts with some theory. You will learn about the directions of wind and find out the names of each strange-looking part that makes up your new toy. Then you will move to the water and with a few balance tips, you’ll jump on the board. You will learn how to move around the mast, the best way to hold the boom, the correct stance, direction of your feet, toes, elbows, hips and of course direction of looking. These are all little tricks that are the key to success, so breath, relax and enjoy the ride. Next on the list is steering. This is the point where you will actually learn to move with all of this gear, which from afar might not look easy, but with time everything will come in its place. It is really important to understand the difference between “sheeting-in” and “sheeting-out”, “downwind” and “upwind”, what the correct way to work with the boom is and how to control the course of sailing and change of direction. Soon you will get tips for sailing upwind and start building the foundation of the first turn – the TACK. Confidently sailing upwind is a proud moment for teachers because after mastering this, the student becomes more independent and can practice on their own. The student would have covered the foundations of windsurfing: body position, stance, steering, making a turn and sailing upwind, and will be ready to make the next step. It normally it takes 6 to 8 astronomical hours plus a few hours of practice for someone to get all the necessary information and to be able to move on to intermediate lessons and delve into the harder part. This is where patience, dedication and a tough spirit are required, but also where the fun begins. This is also the part when, you as a student are going to have the chance to experience stronger wind conditions, when the lessons require more practice and the adrenaline starts kicking in. The people who prevail after this episode in their windsurfing “career”, have huge appreciation looking back to those memories. Once you have mastered the basics, your main objective would be to change the beginner gear quickly and progress into FUN board equipment. Fun boards are those boards, that look more and more like surf boards – smaller and lighter, they are more radical boards and you can see them on pictures with riders shredding waves or gliding in turquoise waters. 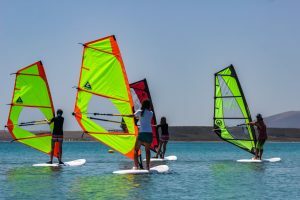 in order to be able to enjoy your beginner journey with windsurfing, you need to have all windsurfing techniques explained by a trusted and qualified professional instructor at a spot that is suitable for your level. You have to be prepared that the sport is not an easy one, but stick to it and follow the right steps, and the ride will be elating and each accomplishment – a moment of pride. Congrats to everyone who has decided to make a step off the ordinary by stepping into a new way of living, as extreme sports are a great chance to connect with nature and therefore it has to be done responsibly! Keep in mind that extreme sports can be hazardous sports. We, from Siroko Wind Club, love windsurfing. It has given us all so much joy and it has changed our lives for the better. It was also our bridge to finding a passion for kitesurfing, which also has a big part in our club. Kiteboarding is a sport invented by windsurfers and they both go hand in hand, so we hope it always stays like this!